This is the first of the Artemis Fowl's triology. It has a fantastic side which is great, but ther first book wasn't really good. Eoin Colfer installed the caracters, but something was missing. The plot was great and unique, but still I didn't like it as much as the other two. This is now a bookring. Released on Thursday, July 08, 2004 at By Mail in Sent to a fellow BookCrosser, Bookring Controlled Releases. This is the start of my first bookring. Remember to enjoy the book, but don't keep it more than 6 weeks and pass the book along. Agh! Sorry, all, that this has been taking me so long. I was on vacation and have a *stack* of bookring books around that need to be read and sent on their merry way - which Artemis Fowl will be doing soon! Worry not! Released on Thursday, August 12, 2004 at Controlled Release to a friend in Sandpoint, Idaho USA. *sighs heavily* I actually didn't get a chance to finish the book; I have a PILE of books right now that I need to cram before school starts that are on my English class reading list, and [very, very, very] unfortunately, school must come before BookCrossing. *sighs again* I did get part way through it, though. I admit that the writing style was light and didn't hold my interest, but that's just my opinion. The plot itself is brilliant for younger readers! Artemis Fowl has arrived! I will journal once I have read it - probably the middle of next week as I have one bookray book to do before this one. I'm really looking forward to this! The book arrived today. I will start reading it once I have finished the bookring book I am currently reading. Though everybody seems to love the book, I have to admit that I am a bit disappointed after I finished it. I can only fully agree with KarinAlyssa. Nevertheless I will read the other two books of the trilogy. I will send the book off to Mytilusgirl in the next days...as soon as I find time to go to the post office. I am *so* looking forward to reading this - thank you! I thought the premise was superb, but like quite a few of the readers before me I was slightly disappointed in the overall product. I suspect this could be because my expectations were so high! I understand that books two and three are better, so I shall be keeping an eye out for them. The book was posted today. Received today, and am really looking forward to reading. Thank you! Apologies for keeping this book for so long - I've been on holiday (sometimes being a student is a good thing) pretty much since I got it and haven't been able to ship it! But I'll send it on it's way as soon as I'm able. I was really surprised by this book. I was expecting it to be much more child-like than it was, and really enjoyed it. I'm definately going to try to read the rest of the series. Thank you so much for introducing me to this author! I was really looking looking forward to this one after hearing all the hype, but unfortunately I didnt get along with it very well. I am not sure why but it irritated me. I guess I was expecting an Laex Rider (Horowitz) clone, but that wasnt what I got! The book wasnt bad, I could imagine loving it when I was a kid, but the writing style felt a little young for my mature 27 years! ;o) LOL! its just that i dint particularly enjoy it :o( I wasnt keen on Butler and Artemis really p***ed me off from the outset! Never mind, you cant win em all! Just received this in the mail today. The poor book had quite a trip from the UK - the packaging was ripped up, but the book is not damaged. Can't wait to read this! 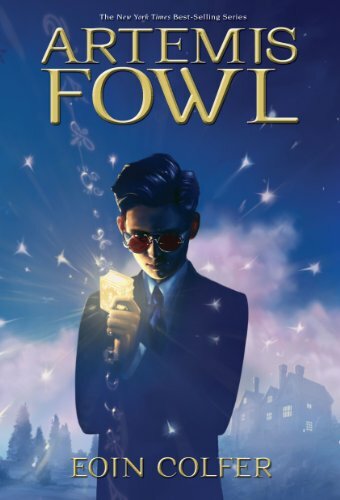 I agree with the other readers' comments about this book - I had heard a lot of good things about the Artemis Fowl series so I was eager to give this book a try, but I found it just okay. I didn't love it, and I didn't hate it. That's okay though - I felt the same way when I read the first Harry Potter book - it didn't live up to the hype although I could see why kids really liked it. I persisted with HP and ended up really liking the series, so I'm going to try the next Artemis Fowl book and see if I like it better now that the characters have been established. That said, this was a fun book to read. There are so many novels with magic and fairies and other worldly creatures in the children's market these days, but I always enjoy seeing what sort of rules each author sets for magical creatures. I also had fun deciphering the code and translating the message at the bottom of the pages. I know I could have just done a google search, but it was much more in the spirit of the book for me to get out a pad of paper and go symbol by symbol. In addition, I really like the premise of this book and the fact that none of the characters are completely black or white. The bad guys still have moments of weakness and show signs of humanity, which I prefer to the usual caricature of the villains in children's books. I look forward to reading the next book to see what happens next! I'm waiting to see if Artemis turns away from the dark side. Thanks to KarinAlyssa for sharing this book! The prophecies of Ohm phlegm pot cleaner to Frond elfen king. I am Ohm phlegm, pot cleaner to the king. But I am much more than that for I see the future written in the phlegm. For centuries we pixies have read the phlegm but I am the best there has ever been. My visions are generally of little importance. I foretell outbreaks of troll pox or gas spasms among elderly dwarfs. But sometimes even a poor pot cleaner can see wondrous things. A vision came to me two moons ago when I was gazing deep into his majesty’s own phlegm pot. I was heating the pot over a flame when the sign appeared. This vision was more vivid and detailed than any I had previously seen. Because of its importance I decided to write it down for posterity and so I can say I told you so. I saw an age when the People have been driven underground by the Mud Men. This is what the phlegm told me. In this time one shall come among us. Fowl by name and foul by nature. A mud man unlike any other. He shall learn our secrets and use them against us. I see him now as plain as day. His face is pale. He has dark eyes and raven hair. Yet it must be a mistake for he seems a mere youth. Surely no mud boy could outwit the People. But now I see that the boy is not alone. He is aided by a formidable warrior scarred from a thousand battles. This Fowl shall hold the People to ransom for their most precious possession: gold. And in spite of all our magic, there is still a chance that he will prevail. For he has discovered how to escape the time field. Unfortunately how the story ends I cannot say. But there was more to see. There is another story to come. Someone will bring the People and the Mud Men together. The worst of both races. This fairy’s goal is to grind all the creatures to earth beneath his boot. And who is this traitor? It is not clear. But he shall start a war unlike anything the People have ever seen. Those who were enemies shall be united against him. And for the first time there will be mud men below ground. I have one clue to his identity: a riddle. Goblins shall rise and Haven shall fall. A villainous elf is behind it all. To find the one who so disappoints. Look ye to where the finger points. Instead of one face, this elf has two. Both speak false and none speak true. His true aim is to seize command. I know. It's not very plain, is it? I don’t understand either. But perhaps in the future all will become clear. Look for a power hungry elf who has a finger pointed at him during our tale. And so this is Ohm’s legacy. A warning that may save the world from total destruction. There’s not much to work with I know. The details are a bit sketchy. My advice to you is to consult the phlegm. It may be that you are sensitive. I have buried this prophecy with my phlegm pot. If you are not fortunate enough to work as a pot cleaner then there is usually a supply of phlegm every time you have a cold. Here ends the first prophecy of Ohm. Because of the importance of my visions I shall repeat the prophecies once more. If you have just begun to understand the text then read on. If you have worked out the entire message then congratulations. Now go and save the world. Mailed back to KarinAlyssa today via air! This book made it back home today. It was my first bookring and I am glad it had been enjoyed in many parts of the world. Thank you so much, the book seems to be in the same state as in June '04. To fulfill Melinda's wish. Enjoy !!! This book arrived today in Wisconsin. Thanks for sharing it with me, KarinAlyssa! I sent this book along home with my daughter- seems like it will be one she will enjoy reading...then she will return it to me so that I can read it.